A new document attesting to the connection between Nazi Germany and the Mufti was released in March 2017. In the letter published by the National Library of Israel Archives, SS Chief Heinrich Himmler heaps praise upon Mufti al-Husseini, stating that the Nazi leadership has been closely following the battle of freedom-seeking Arabs - and especially in Palestine - against the Jewish invaders . Himmler ends the letter by bidding the Mufti warm wishes for the continuation of your battle until the big victory. This letter was delivered in the Fall of 1943, two years after the Mufti's famous meeting with Adolf Hitler. 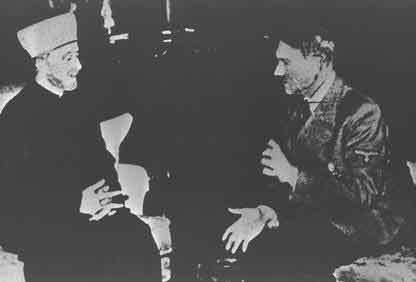 Read more about the conversation between Hitler and the Mufti, CLICK HERE. 1 “Grand Mufti Plotted To Do Away With All Jews In Mideast,” Response, (Fall 1991), pp. 2-3. 2 Record of the Conversation Between the Fuhrer and the Grand Mufti of Jerusalem on November 28, 1941, in the Presence of Reich Foreign Minister and Minister Grobba in Berlin, Documents on German Foreign Policy, 1918-1945, Series D, Vol. XIII, London, 1964, p. 881ff in Walter Lacquer and Barry Rubin, The Israel-Arab Reader, (NY: Facts on File, 1984), pp. 79-84.